A fragment of a planet that has survived the death of its star has been discovered by University of Warwick astronomers in a disc of debris formed from destroyed planets, which the star ultimately consumes. The iron and nickel rich planetesimal survived a system-wide cataclysm that followed the death of its host star, SDSS J122859.93+104032.9. Believed to have once been part of a larger planet, its survival is all the more astonishing as it orbits closer to its star than previously thought possible, going around it once every two hours. The discovery, reported in the journal Science, is the first time that scientists have used spectroscopy to discover a solid body in orbit around a white dwarf, using subtle variations in the emitted light to identify additional gas that the planetesimal is generating. Using the Gran Telescopio Canarias in La Palma, the scientists studied a debris disc orbiting a white dwarf 410 light years away, formed by the disruption of rocky bodies composed of elements such as iron, magnesium, silicon, and oxygen – the four key building blocks of the Earth and most rocky bodies. Within that disc they discovered a ring of gas streaming from a solid body, like a comet’s tail. This gas could either be generated by the body itself or by evaporating dust as it collides with small debris within the disc. The astronomers estimate that this body has to be at least a kilometre in size, but could be as large as a few hundred kilometres in diameter, comparable to the largest asteroids known in our Solar System. White dwarfs are the remains of stars like our sun that have burnt all their fuel and shed their outer layers, leaving behind a dense core which slowly cools over time. 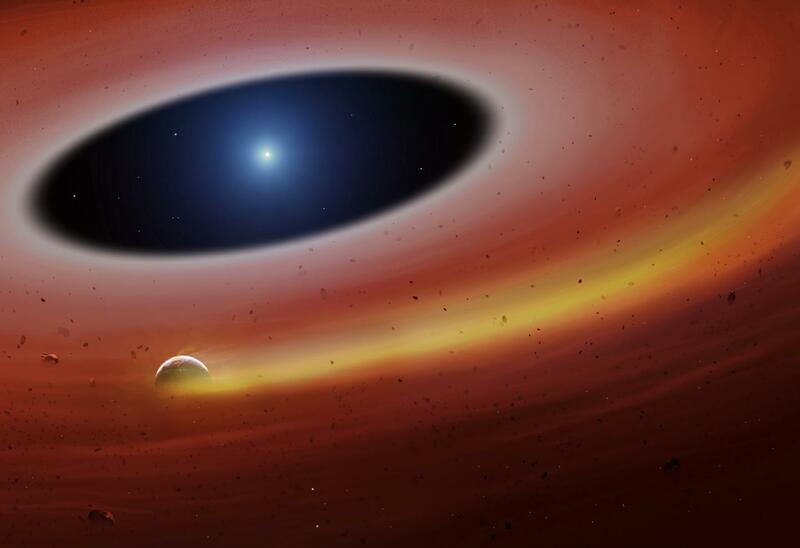 This particular star has shrunk so dramatically that the planetesimal orbits within its sun’s original radius. Evidence suggests that it was once part of a larger body further out in its solar system and is likely to have been a planet torn apart as the star began its cooling process. Lead author Dr Christopher Manser, a Research Fellow in the Department of Physics, said: “The star would have originally been about two solar masses, but now the white dwarf is only 70% of the mass of our Sun. It is also very small – roughly the size of the Earth – and this makes the star, and in general all white dwarfs, extremely dense. Professor Boris Gaensicke, co-author from the Department of Physics, adds: “The planetesimal we have discovered is deep into the gravitational well of the white dwarf, much closer to it than we would expect to find anything still alive. That is only possible because it must be very dense and/or very likely to have internal strength that holds it together, so we propose that it is composed largely of iron and nickel. The discovery offers a hint as to what planets may reside in other solar systems, and a glimpse into the future of our own. Dr Christopher Manser said: “As stars age they grow into red giants, which ‘clean out’ much of the inner part of their planetary system. In our Solar System, the Sun will expand up to where the Earth currently orbits, and will wipe out Earth, Mercury, and Venus. Mars and beyond will survive and will move further out. “The general consensus is that 5-6 billion years from now, our Solar System will be a white dwarf in place of the Sun, orbited by Mars, Jupiter, Saturn, the outer planets, as well as asteroids and comets. Gravitational interactions are likely to happen in such remnants of planetary systems, meaning the bigger planets can easily nudge the smaller bodies onto an orbit that takes them close to the white dwarf, where they get shredded by its enormous gravity. “Learning about the masses of asteroids, or planetary fragments that can reach a white dwarf can tell us something about the planets that we know must be further out in this system, but we currently have no way to detect. Dr Manser and Professor Gaensicke were supported by the European Research Council (ERC) under the EU’s research and innovation programme (grant agreement 320964). The European Research Council, set up by the European Union in 2007, is the premiere European funding organisation for excellent frontier research. Every year, it selects and funds the very best, creative researchers of any nationality and age, to run projects based in Europe. It offers four core grant schemes: Starting, Consolidator, Advanced and Synergy Grants. With its additional Proof of Concept grant scheme, the ERC helps grantees to bridge the gap between grantees’ pioneering research and early phases of its commercialisation. To date, the ERC has funded some 9,000 top researchers at various stages of their careers, and over 50,000 postdocs, PhD students and other staff working in their research teams. The ERC strives to attract top researchers from anywhere in the world to come to Europe. Key global research funding bodies, in the United States, China, Japan, Brazil and other countries, have concluded special agreements to provide their researchers with opportunities to temporarily join ERC grantees’ teams. The ERC is led by an independent governing body, the Scientific Council. The ERC President is Professor Jean-Pierre Bourguignon. The overall ERC budget from 2014 to 2020 is more than €13 billion, as part of the Horizon 2020 programme, for which European Commissioner for Research, Innovation and Science Carlos Moedas is responsible.